When it comes to home décor trends, there are some that just need to lay down and die. These instantly make a room look dull, dated, and tacky. For your new home design, avoid these tasteless trends like the plague. Your new house will thank you. There are better choices for finishing off your home than these five options. Instead of fads, choose home design trends that are timeless and have staying power. A relic of the ‘60s and ‘70s, fake wood paneling always looks dark, dreary, and dated. What’s more, it never looks like real wood. Most people who encounter this faded trend in their homes are quick to rip it out or paint over it. Both are good ideas, although painting fake wood paneling might be the better choice if you are budget-conscious. If you do like the idea of wood on the walls, choose real wood, and keep it to an accent wall so it doesn’t feel like you’re living in a cabin. The repeating zig-zag pattern called chevron had a huge surge in popularity a few years ago. Chances are, you could find chevron on everything from rugs and textiles, to curtains and pillows, to patterned chairs, floors, and tile. However, what once seemed fresh and modern now feels played-out and cliché. If you crave pattern in your home, go for something classic yet visually interesting, like stripes, paisley, or dots, instead. Remember sponge-painting? This look for walls was popular throughout the ‘90s and early ‘00s. It was often done with colors like mauve, hunter green, or a dusty, denim blue. Unfortunately, it never looked sophisticated – just tacky and muddled. What was it supposed to be imitating, anyway? Beige walls, beige furniture, beige carpet – it all adds up to a whole lot of boring. Once upon a time, it seemed like most new houses were awash, from top to bottom, in a coat of blah beige. There are far more interesting neutrals to play around with. However, if you insist on keeping the bones of your home decor neutral-toned, don’t forget to add color through additions like furniture and artwork. Tile countertops are a nightmare in the kitchen. Grout is hard enough to clean in your shower, but in the kitchen, it will collect everything from crumbs to dirt to bits of food. Plus, tile can easily crack, chip, and break. Combined with the grout problem, tile countertops quickly wear out and look dingy – who knows why this ever became a fad? These days, a much more modern option that is till budget-conscious for your kitchen home décor is a solid surface countertop that mimics the regal look of granite or quartz. Don’t fall victim to interior design fads and trends that will quickly fade within a year or two. If you really love the look and must include it in your design, choose to add it in a way that’s more temporary, such as with pillows, artwork, and fabric, as these can be switched out far more easily. Posted in Design and tagged home decor, home decor trends, home design, interior design on May 9, 2017 by metzler. 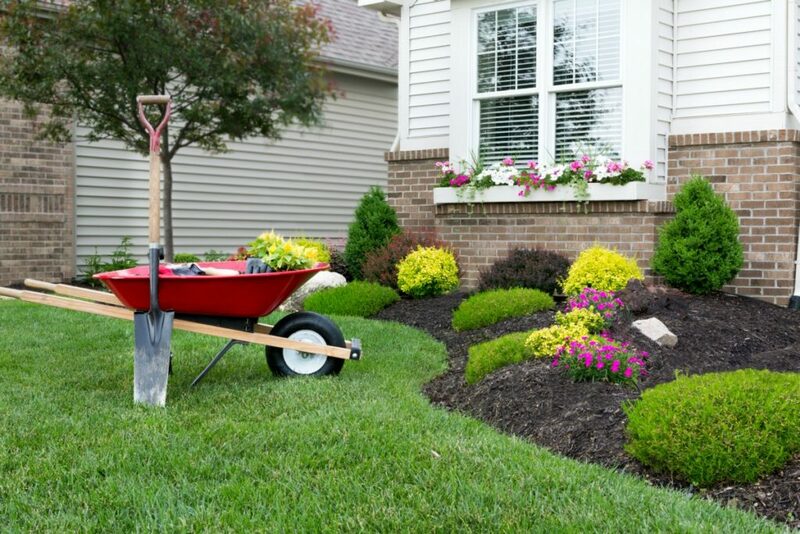 Here are a few home maintenance tips for spring. Check for loose or leaky gutters. Improper drainage away from the home can lead to water in the basement or crawl space. Make sure that your gutters are cleaned of debris, secured property to the house, and that the downspouts are long enough to drain away from the foundation of the home. Check outside hose faucets for freeze damage. To check for freeze damage, turn the water on and place your thumb or finger over the opening. If you can stop the water from flowing, this likely means you have a damaged pipe inside the home, and you’ll need to replace it. Check your wooden deck. Replace any boards that are warped, splintered or cracked before you get into the barbeque season, and give your wooden deck a new coat of weatherproofing sealant. Seal around windows and doors. Air leaks happen around windows and doors, and with the hazy, hot and humid weather around the corner, now is a good time to caulk seams and re-glaze windows, where needed. Check your sidewalks and other concrete areas. Ice melt can cause concrete to crack. If you notice that your walkways or patio cracked or shifted over the winter, now is a good time to make those repairs. Trim shrubbery. If there are any scrubs or trees that rub up against the home, now is a good time to trim them back before a thunderstorm rolls through. Inspect the exterior of your home for loose siding, shutters or shingles; and if your home is painted, check for peeling or cracked paint. When it comes to exterior repairs, particularly anything that involves heights, we strongly recommend you call a professional so repairs can be done safely. Check smoke detectors. If you haven’t done so already, replace the batteries in all of your smoke detectors. This should be done in the spring and again in the fall to keep them working properly and your family safe. Inspect attic for leaks. If you have an attic that is accessible, the spring is a good time to crawl up there and inspect for leaks. These will be fairly noticeable as water marks will show on the insulation. Get AC inspected. Schedule a check-up for your air conditioning unit with your heating and cooling company. They will inspect your unit and make sure it is running at maximum efficiency before the summer heat hits. Change ceiling fan rotation. For summer months, ceiling fans should rotate counter-clockwise, as you look at it from below. Posted in Home Tips and tagged Home Maintenance, Home Tips on May 2, 2017 by metzler. The votes are in. 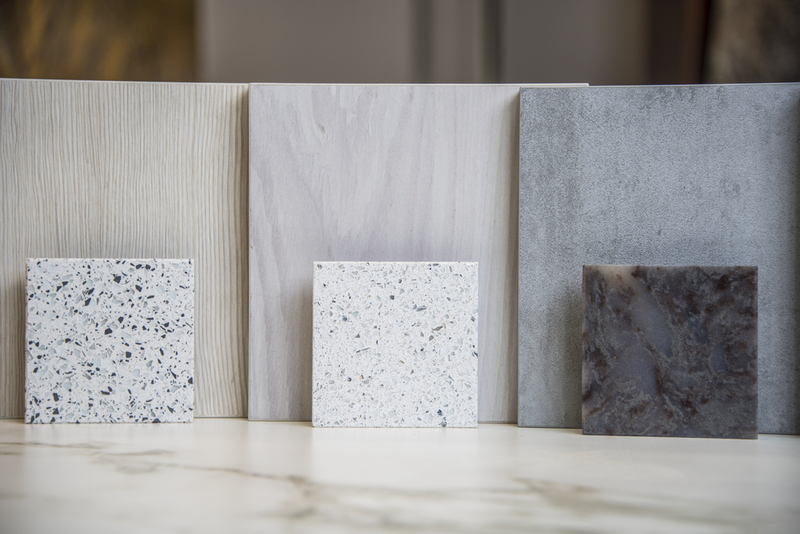 For 2017, designers, tastemakers, and experts will advise you to look beyond granite and instead opt for its newer, cooler cousin: quartz. 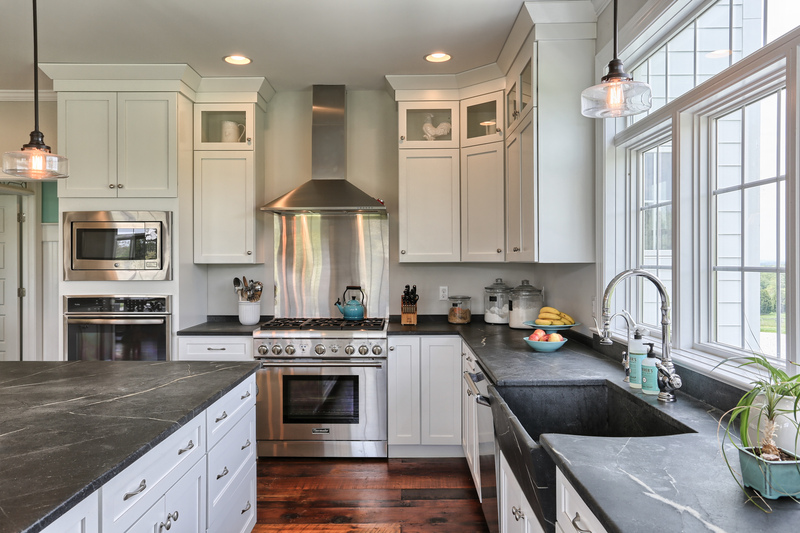 For years, granite has reigned supreme as the be-all, end-all for kitchen countertops. It is beautiful, scratch and heat-resistant, and easy to clean and maintain, after all. However, this tried-and-true stone is seeing competition. 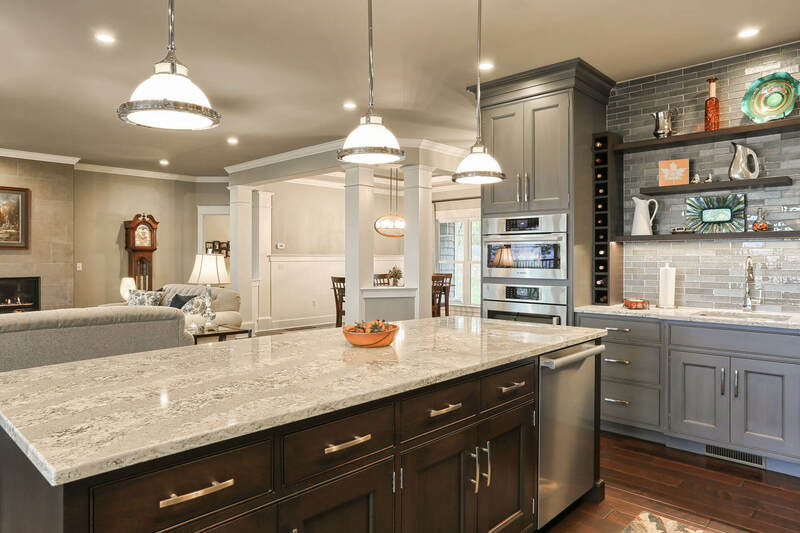 Learn about why quartz is the hot, new option place, plus some other kitchen design trends you might want to consider besides granite or quartz for your countertops. So, why is quartz usurping granite for most-loved countertop material? The main reason is durability. Quartz beats both granite and marble in this area (although the latter two have been the most popular high-end manufactured stones used in the kitchen for years). Not only is quartz naturally stain-resistant, scratch-resistant, and heat-resistant, it also doesn’t need to be sealed, unlike granite and marble, which require periodic re-sealing to maintain their integrity. On top of these pluses, quartz is also unaffected by acidic foods, which can wear down the finish on other surfaces. As far as affordability, quartz falls squarely between granite and marble on the price scale (marble is more expensive, granite is slightly less expensive). Finally, quartz has become more appealing to the eye in recent years due to new manufacturing techniques. All of the above facets make quartz a shoe-in for the kitchen. Love the look of natural stone for your kitchen remodel, but don’t have the budget for them? Try any of these alternative kitchen countertop trends. No matter the type of kitchen design you have, butcher block will look classic and timeless. If you are wary because you think this type of counter would be high-maintenance, worry not— scratches can be sanded out easily and sealed with mineral oil. Although countertops made of concrete will need regular sealing, they are a modern option that will be durable in your kitchen. Plus, they can be customized for special configurations, and even have special materials, like seashells or stones, embedded in the surface. 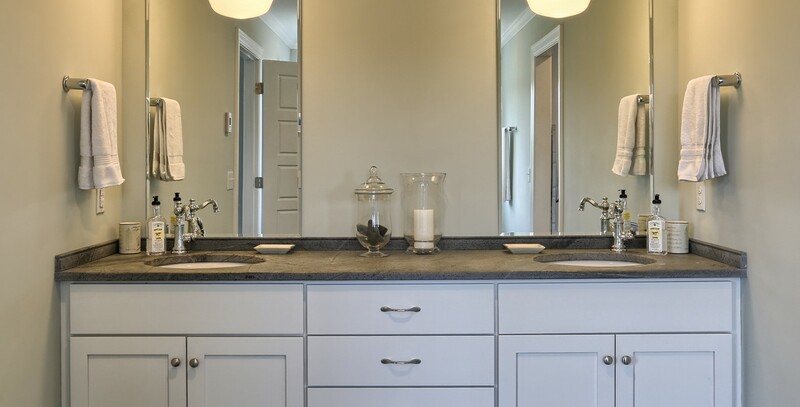 Solid surface countertops can emulate natural stone surfaces and don’t require sealing. While they are not impervious to scratches or heat, they are a low-cost way to get a high-end look. Modern laminate countertops outdo the laminate of the past by leaps and bounds. New versions are far more durable, successfully mimic the look of natural stone, and require little maintenance and no sealing. For your home, the right kitchen countertops will provide the look you want and the amount of durability you need. Look to kitchen trends for fresh ideas, whether you want something timeless or totally unique. 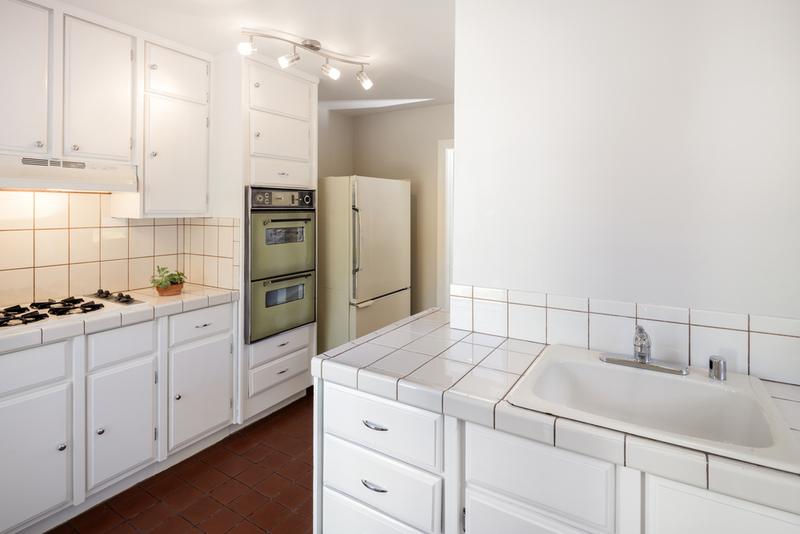 Want to get started on a kitchen renovation? Contact us to discuss all of the possibilities. Posted in Design and tagged kitchen countertop trends, kitchen design, kitchen remodel, kitchen trends on April 25, 2017 by metzler. Look at the service door. The service door, or side door on your garage, is often one of the easiest points of entry for a burglar. Make sure the door has a deadbolt and a heavy-duty strike plate, as should all exterior doors in your home. Install a garage door sensor. Sometimes your garage door security is compromised simply because someone forgot to close the door. This is where a sensor and monitor come in. Attach the sensor to the garage door and then place the monitor somewhere inside your house. If the garage door is open, the monitor will let you know. Use an old-fashioned lock. If you are going to be away from your home for an extended period of time, you may want to lock your garage door track. Simply drill a hole in your garage door track just above one of the rollers and fasten a padlock through the hole. Even if a robber can fish the garage door lock open from the outside, he will not be able to actually roll up the door. Install a smart home door opener. 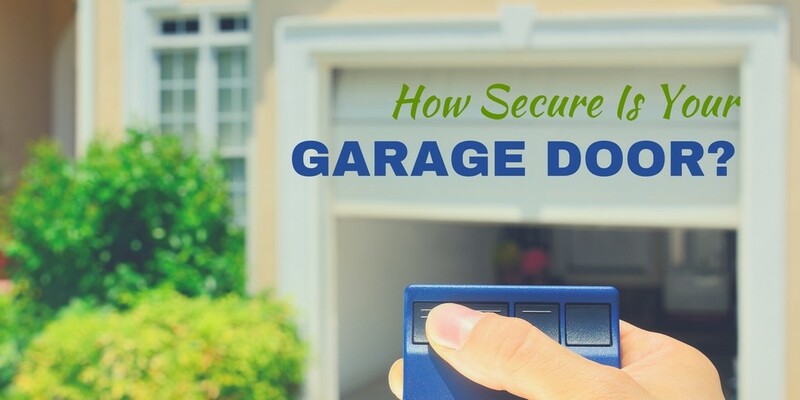 These high-tech garage door openers come with built-in security features such as monitors and lighting controls – all connected to your smartphone. This means that from anywhere, you can make sure your garage door is closed and your home is secure. Posted in Home Tips and tagged home, Home Maintenance, Home Tips, tips on April 18, 2017 by metzler. Spring is a time of new beginnings, fresh starts, and renewal. What better time to start building your dream home? 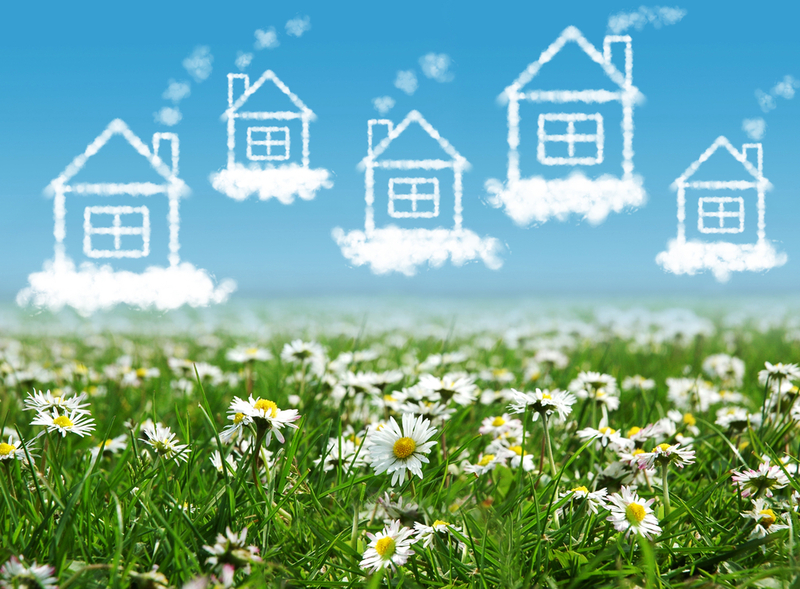 There are a few other great reasons to get going on your custom home in early spring. Find out what they are and get closer to breaking ground. The best time to build a home is when the weather is cool and dry. Naturally, these conditions are common in fall and spring. Building in summer or even winter is a different story. Weather extremes, from searing heat to bitter cold, will hamper the workers’ progress. Cold winter days especially equal less sunlight and less working hours, which means the job will take longer to get done. Additionally, in the summer, humidity can interfere with drying times for materials like cement, plaster, and paint. Let’s not forget that winter comes with something that can set back plans for days, even weeks: snow. Long story short: choose the spring to begin to build your dream home, and you will probably have less headaches due to weather. Once the main components are in place for your dream home build (footers/foundation, framing, windows, doors, and roof), workers can complete the interior of your home in any weather. Starting the main components in early spring means that, by the time summer arrives, the heat will not factor into or hinder the workers’ progress. What could be better than settling into your new dream home right when the holidays are approaching? Imagine idyllic autumn mornings spent with hot coffee and a book on your new front porch. Think about cooking soups and stews in your new kitchen, and hosting parties and family gatherings in your new dining room. As the days get shorter and festive times roll around, you’ll be doubly glad that your house is ready and you and your family are nestled inside. Every scenario you dreamed of when you were planning your new custom-built home will be even better when you’re settling in for winter and hosting your friends and family for the first time. What season is more suited for fresh beginnings? Spring, with its strong symbolism related to rebirth and rejuvenation, will also feel like the perfect time to start fresh, from the ground up, on your new dwelling. After a long winter, most people feel energized come springtime, and this attitude can help push your home-building project along to completion. Start building in the spring, and watch your new home sprout from the ground and take root. Want a custom-built home but don’t know where to start? You don’t need to be a building expert to start your project with us. Allow us to be your experts to guide you through this process. Contact us to discuss the possibilities. Posted in New Construction and tagged custom home, custom-built home, dream home build, home-building on April 11, 2017 by metzler. Comedian W.C. Fields once said, “I cook with wine, sometimes I even add it to the food.” Whether wine is part of your latest culinary creation, part of your overall cooking experience or a staple in everyday life, finding the perfect wine storage solution for your kitchen deserves more consideration than you may expect. There are dozens of design elements to consider when installing a new kitchen. Hardware, colors, countertops, appliances and countless selections can be overwhelming. 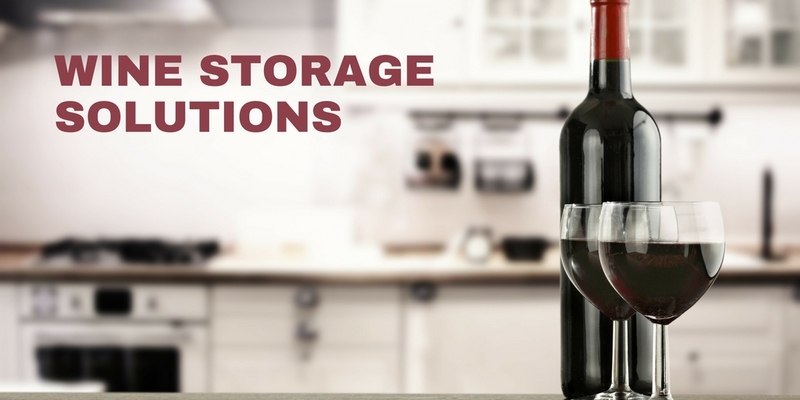 For the homeowner that pops a cork once every few weeks, wine storage may be an afterthought. For the connoisseur, however, making the wrong wine storage decisions could lead to a design flop. Where and how you store wine will be driven by your passion for the vine. Casual partakers may be perfectly fine with a casual solution, but the enthusiast knows that wine storage plays an important role in preserving the contents of expensive bottles that may be used months or years later. Proper wine storage is an exact science that is the basis for how most wine storage units are engineered. Humidity should maintain at 55–75%. Bottles should be stored away from UV light. Excessive vibrations from nearby appliances may prevent disruption of the aging process. Wine bottles have become a permanent fixture in many kitchens. As the rack empties, homeowners purchase more bottles to fill their absence, and access is critical. Whether you’re an oenophile that also has a fully-stocked cellar, or one of the thousands of homes stocking up on a few bottles for monthly gatherings with friends and family, finding a bottle need not take you beyond your kitchen. For the occasional sipper, choosing a wine storage solution without climate control may be perfectly satisfactory. There is a whole world of current storage solutions to consider. Recent trends range from wall pegs, shelves, drawers and racks that come in countless variations. The open wine racks pictured above can be designed into a kitchen island, built into nearby walls or under staircases, installed within lower or upper cabinets with glass doors or integrated into a piece of furniture. 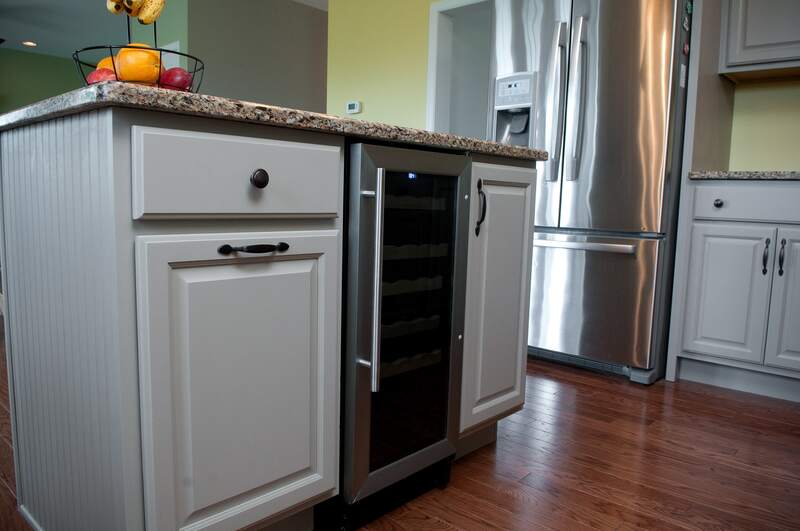 Small, refrigerated units have also become increasingly popular kitchen appliances for even casual wine drinkers. These units are easily incorporated into cabinets with options for upper or lower storage. Units can also be built into walls, islands or nearby wet bars. The enthusiast insists on controlling their collection’s environment. Climate-controlled units are an absolute must. From the smallest chilled wine drawers to units twice the size of an average refrigerator, manufacturers offer a wide selection. In either case, bottles and their labels can be conveniently viewed. Wine appliances seamlessly match their neighboring counterparts. Glasses are in close proximity, ready to be filled. Experienced kitchen designers can not only help you sort out the level of priority of wine storage for your space, but they will know the best options to accomplish your project goals. They have dozens of manufacturer resources to consider and should be familiar with how individual units rate among consumers. If wine storage is one of the big priorities of your project, selecting the specific storage units with your designer may be something best decided sooner rather than later in the process. These solutions can impact other choices in the overall plan, so falling in love with a particular unit during the front end can help your designer to create a space that interacts well with it. Here’s to grape expectations on your next kitchen design project! Posted in Home Tips and tagged home, Home Tips, tips on April 4, 2017 by metzler. Building your own home is an exciting, exhilarating adventure. You get to create a house that suits you, your family, your needs, and your lifestyle. You won’t have to compromise on what you want, nor will you have to endure a lengthy house search that results in a lot of “maybes” and “almosts” but doesn’t result in finding a home that hits every point on your checklist. Building your own house and trusting home builders in Lancaster, PA is truly the only way to get exactly what you want. There are plenty of other great reasons to choose this option, though. Find out what they are and discover why hiring a home builder in Lancaster might be the right choice for you. Hiring a custom home builder takes quite a load off your shoulders when it comes to getting your house built. There are lots of ways these professionals make the process easier on you, not to mention provide a better end product, which is a huge deal. Sometimes, “custom” can mean different things, or the term is used loosely in the industry. Some businesses and contractors only offer one design that comes with options for you to choose from. With the right Lancaster home builder (like us), however, “custom” means “custom.” They will work with you to build the house of your dreams according to your desires, needs, and specifications. Your house won’t be cookie-cutter; it will be uniquely yours. When you choose custom home builders in Lancaster, PA, you won’t have to renovate anything for a long, long time after you move in. The house will be built just the way you want it, so it will be move-in ready and according to your standards. You won’t have to change a thing once it’s built, because the builder will make sure your lifestyle and needs are taken into account with your home design. You will get to enjoy living in a home that was built just for you. Were you to tackle home building on your own, you would probably get charged full price for sourcing all of the necessary materials and fixtures. Home builders in Lancaster, PA, on the other hand, will have existing relationships with suppliers from years in the industry – this means they can source everything for your home and probably cut a deal, too. To put it simply, Lancaster home builders are who you should turn to if you want a custom home. They can make the process easier with less stress, not to mention save you money. Learn more about our custom home building process. Posted in New Construction, Renovations and tagged home builders in PA, Lancaster home builders, Pennsylvania home builders on March 28, 2017 by metzler. Whether you want to feel serene and relaxed the second you step through your front door, are looking for a calming oasis in your bedroom or need a soothing retreat in the living room, the right paint colors can help you get there. The best part about these interior paint colors is that they add a touch of style and sophistication to your home at the same time as they provide a calm atmosphere. Choose any of them and feel your blood pressure drop when you spend time surrounded by a beautiful color. Keep your interior décor a haven from the bustle of the outside world by choosing paint colors that remind you of nature. Whether you prefer to keep things warm or cool is up to you, but keep in mind that cool colors read as more refreshing, while warmer shades feel cozier. For the freshest possible look, you can’t go wrong with green. The key is to keep the shade you choose for walls toned-down, but not so cool that it looks icy. Seafoam or sage green are both fresh interior paint colors that will bring to mind dewy spring mornings or a sun-dappled garden. Bring the relaxing feel of a rainy day and a cloudy sky to your interior when you paint the walls a soft, soothing shade of gray. With the right tone, gray is anything but boring. Instead, it is sophisticated, soft, and gently fades into the background while providing a touch of serene elegance. If you’re looking for pretty and dreamy alongside refreshing and relaxing, a soft lavender color, such as pale lilac, is the perfect solution. To keep it from looking too sweet, this soft shade should be paired with neutrals and earthy colors, like creams, browns, and whites. Yellow is one of the happiest colors, and using a pale version of the shade instantly spells a warm welcome for whoever sets foot in your space. To keep it relaxing, stick to tones of yellow in the pale, warm, and buttery realm. Think about the color of scones with butter – not the hue of sunflowers. 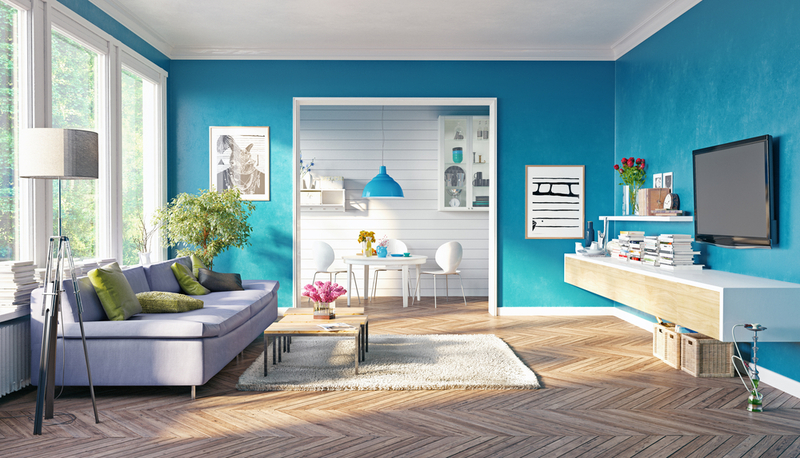 Blue colors that evoke the sea or the sky will instantly make any interior design feel calm. For a refreshing feel, go with brighter tones like robin’s egg blue or a beautiful shade of aqua. To make a room feel larger, brighter, and airier, go for shades of interior paint that make you think of the clouds and sky, such as gray-blue or pale blue. Posted in Design, Home Tips and tagged interior decor, interior design, interior paint, paint colors on March 21, 2017 by metzler. Regardless if homeowners plan to sell or stay for years, redesigning a bathroom is a common renovation most people will encounter. Bathroom design holds a key to making homes more usable for not only their present inhabitants and visitors, but also future owners and generations. Designing a space with that philosophy in mind is called Universal Design. What is a Universally Designed Bathroom? Universal design is sometimes mistaken to be solely intended for handicapped accessibility, but creating a space that will be suited for all ages or abilities is what gives Universal Design its name. Effortless use and accessibility for family members of any size or condition will create bathroom designs that minimize lifting, reaching and other movements that could have a potential to cause bodily injury or difficulty. Even if disabilities are temporary, a Universal Bathroom Design will ensure your family, future residents or visitors will be able to powder their nose with ease. 1) Location: Including a bathroom on the first level of a home ensures that the challenge of stairs isn’t an issue. Larger pantries, closets, areas under stairs or portions of ground-floor rooms may provide the ideal spot for your new powder room. 2) Lighting: If possible, installing windows or skylights in bathrooms can provide increased natural visibility. Motion-sensing light switches eliminate the challenge of hunting for switches in the dark. Well-lit showers are a must – limiting the potential for slips in wet areas. Soft lighting that decreases glares and shadows will help people of all ages and mobility to navigate the bathroom with ease. 3) Clearance: Using 34”-36” entrance doors will also allow better access for mobility devices. Small bathrooms may be your only option, but when possible, provide ample clearance for turning and movement for canes, crutches and wheelchairs. Bathrooms should be at least 60” x 60”, but ideally larger for those requiring transfer assistance from a wheelchair to a toilet or a shower. Whenever possible, install walk-in showers so the hurdle of a tub’s side is removed. 4) Flooring: Non-slip materials are a must for bathrooms, as falls in these areas can be potentially life threatening. Ceramic tiles aren’t an ideal choice, but if elected should be smaller tiles to allow for more non-slip grout areas. Use textured ceramics that are safer than highly glazed products. Other great options for safer bathroom surfaces include non-slip vinyl, cork and bamboo flooring. 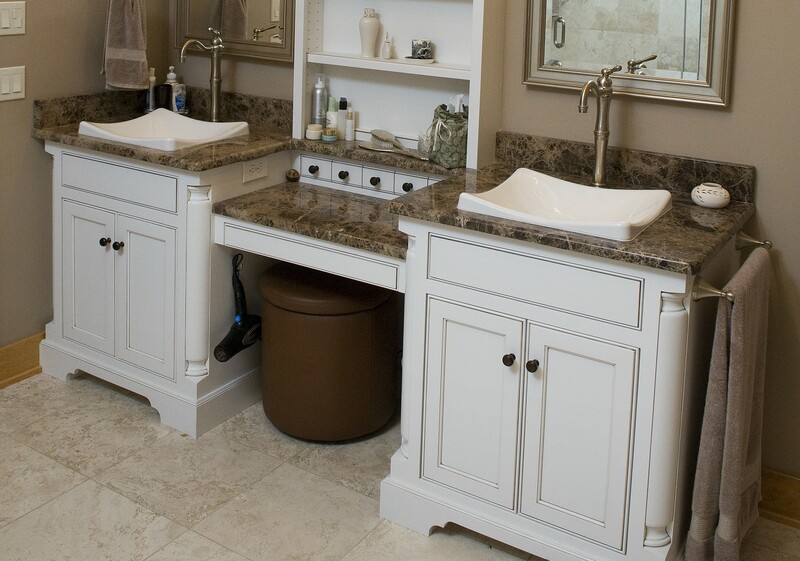 5) Counter & Sink Heights: Consider knee space at sinks for those in wheelchairs. 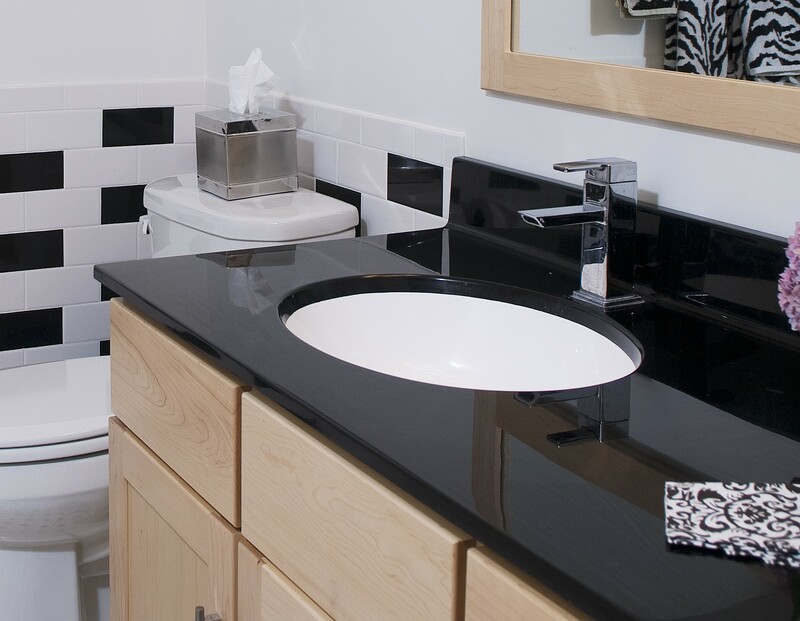 There are beautifully designed wall-mount and pedestal sinks that could allow a wheelchair user to conveniently move closer to wash their hands and face or brush their teeth. Certain sink designs with bowls above counters may also not be good choices for small hands and arms trying to reach above them to operate faucets. 6) Faucets & Hardware: Imagine someone trying to use sinks, toilets, doors and other access points with a closed fist. Choose hardware that can be easily used by small hands, those with arthritis or operated easily with one hand. Likewise, touchless faucets, automatic flush toilets and lever door knobs will ensure challenges are minimized. Pay careful attention to position access points on faucets, toilets and showers to ensure that they can be reached standing or sitting, regardless of age. 7) Toilets: Comfort-height toilets are typically 2” taller than regular toilets and make the transition from a wheelchair easier. Be sure there is 30”-48” of floor space on at least one side of toilets for wheelchair transfers. The higher seat surface will also make it easier to access and exit for those with back or leg pain, or those who could be temporarily injured and using crutches. 8) Storage: For frequently needed items such as bathroom tissue, linens or toiletries, provide storage areas below your waist. Make it easy to find these items under or on top of vanities, or in adjacent cabinetry. In the shower, include ample shelving for soaps, shampoos and razors. These shelves and compartments should hold these items securely. Understanding and implementing smart Universal Design features will ensure that your home is easier to resell, and that its bathrooms are perfect for you, your family and friends, regardless of what life throws at them. *Photos used in this article are stock. Posted in Design and tagged Additions & Renovations, home, Renovations on March 14, 2017 by metzler. We were recently honored to have one of our kitchens featured as “Kitchen of the Week” on Houzz.com. We built a beautiful country farmhouse style home in southern Lancaster County. Photos of the kitchen caught the eye of an editor at Houzz, who in turn did a feature story on the kitchen. The homeowners worked with Phil Clemmer of Swartz Kitchens and Baths on the design of the kitchen. The end result was a breathtakingly beautiful kitchen that will serve the owners well for years to come. 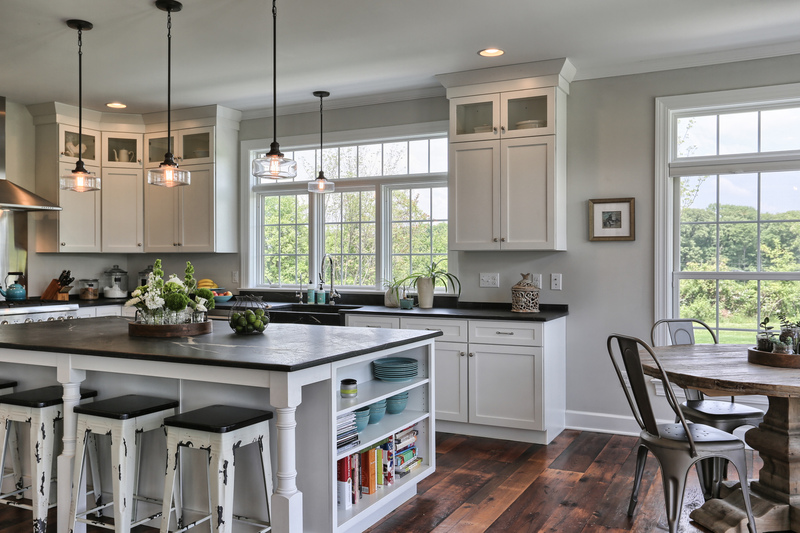 Classic white cabinets with glass insets, soapstone countertops and reclaimed hardwood floors give this kitchen the feel of an old farmhouse. The custom cabinetry with finished interiors includes specialized drawers and cabinets, including built-in trash cans next to the sink. 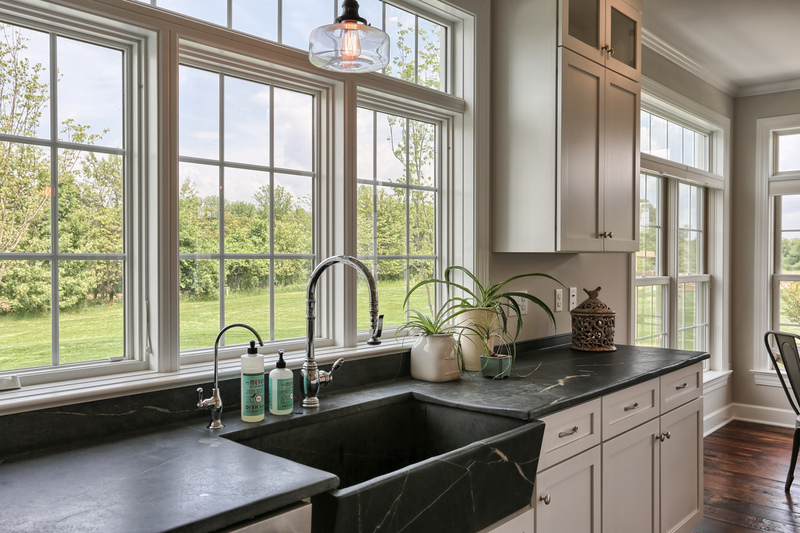 A soapstone sink sits under a bank of extra tall windows that overlook a patio and backyard. The tall, clean-lined cabinets and walls of windows give the kitchen a bright and airy feel. The large island seats four, includes plenty of storage and incorporates built-in shelves at the end to hold cookbooks. 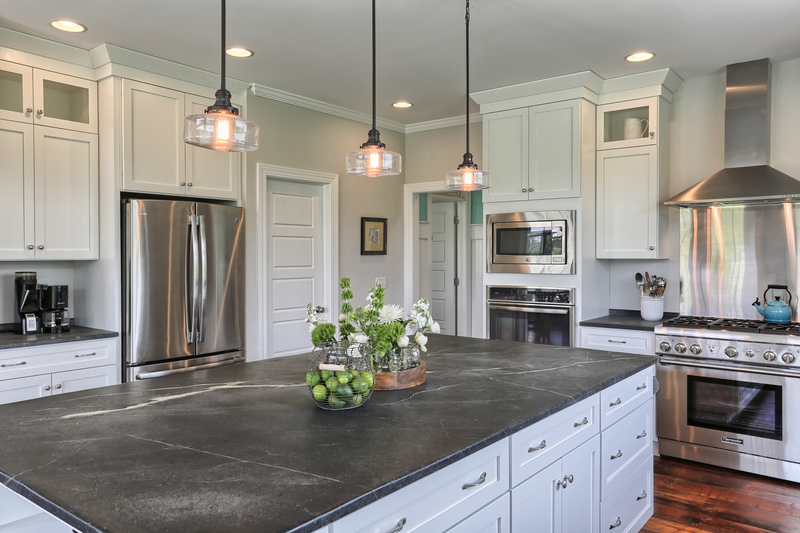 The soapstone surface creates an ideal space for prepping and serving. Three pendant lights provide additional illumination to the recessed can lights. Posted in Design and tagged Additions & Renovations, home on March 7, 2017 by metzler.